By J. David Santen Jr.
Virginia Lee Burton's 1943 children's classic Katy and the Big Snow is set in the fictional town of Geoppolis. On an illustrated map we see a grammar school and a library and a church. Geoppolis has an uptown and a downtown, bus and train service, and an airport. It has a piggery and a dairy and a chicken farm. And, of course, the highway department where Katy the tractor stays until her command performance in clearing the roads and rescuing the city. For what we want in a community, this seems like a pretty good start (as long as you live upwind of that hog operation)—a compact town, with all the amenities that day-to-day living requires. Maybe the icehouse property could be redeveloped into artist lofts or a climbing gym. And that oversize post office site just south of downtown? How about a new hotel and convention center? 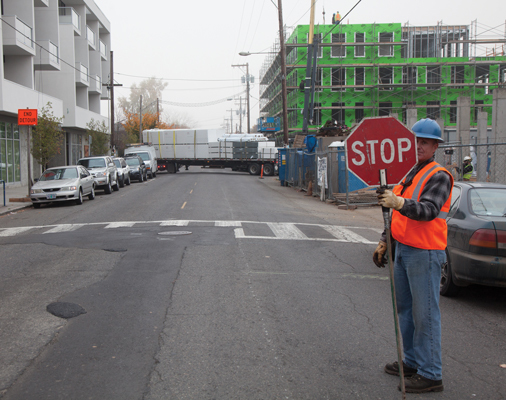 If Geoppolis were in Oregon, it would have a comprehensive plan—a road map for the city's future to ensure that Geoppolis could meet its housing and transportation and infrastructure and economic development needs for the next twenty years. This plan might be stashed in a city hall filing cabinet, untouched for a decade or two. Then one day, city planners and economic development types, eager to expand the city's urban growth boundary into outlying farmlands for a potential industrial or residential development, would drag the plan out and begin the grueling process of updating it according to Oregon law. This update might spark a decade-long tussle between planners and citizens and special-interest groups that would tumble through layers of bureaucracy before crashing through the doors of the Oregon Court of Appeals, where it might then be rejected. Tens, maybe hundreds of thousands of tax dollars later, city officials and lawyers might begin the tedious and uncertain updating process again, hoping to have a final decision in the next couple of years. Forty years ago, Oregon passed a landmark legislation that shaped the state in ways no other legislation has since. It established a national model for statewide land-use planning that preserved high-value farmland, contained cities' periodic fits of sprawl, and, in short, codified Oregonians' values into planning approaches. That's the legend of Senate Bill 100, the 1973 Oregon Land Conservation and Development Act. Thanks to the efforts of a Willamette Valley dairy farmer and state senator, a Teamsters rep, city folks and associates, and Governor Tom “Bottle Bill” McCall, Oregon has enjoyed the emergence of viticulture, a blooming food-shed robust enough to feed the 100-mile locavores, and an international case of Cascadia envy. We don't sprawl, not like California or Idaho. We build cities up, not out. We protect our farms. We protect our forests. We have a plan. Every one of our 242 cities has a plan. So do the counties. And where did these plans come from? The answer, set to the tune of a Woody Guthrie song, is that they came from you and me: Oregonians from every corner of the state—urban and rural, east and west, coast and desert—in conversations at public meetings with Department of Land Conservation and Development representatives who tooled around in vans like country preachers (along ridges and rivers) for fifteen months (through fields and forests) in '73 and '74, asking people what exactly it was that they liked so much about (the hills and hamlets) where they lived. Oregon, planned for you and me. It was an era described by landscape architect Ian McHarg in his 1969 book Design With Nature: “It is not a choice of either the city or the countryside: both are essential, but today it is nature, beleaguered in the country, too scarce in the city, which has become precious.” We imagined our own precious land, right here with the Jory soils squished between our toes. But we also saw worn farmers stepping down from their tractors at twilight and imagining in their furrowed fields the tracts of new homes and paid-off bank loans. And in this setting, storm clouds gathered—leaded exhaust from the tailpipes of station wagons and moving vans filled with Californians, fleeing their own fallen paradise to our Canaan of the north. So Oregonians told the state officials of their concerns and worries, and the officials listened. From these talks they crafted fourteen official state planning goals in 1974 that every city and county's future comprehensive plan would need to achieve, beginning with Goal 1: “Citizen Involvement,” concluding with Goal 14: “Urbanization,” and acknowledging other issues with every goal in between: preservation of farm- and forestlands, adequate housing, economic development, clean air and water, transportation, and so forth. By the end of 1976, all nineteen goals that exist today were in place: Goal 15 dealt with the greenway along the Willamette River; Goals 1619 concerned coastal and estuarine areas, including dunes and beaches, as well as ocean resources. From then on, every Geoppolis across Oregon would use these goals to craft its own comprehensive plan that would presumably account for that city's current and future needs, including the establishment of urban growth boundaries. This legacy has established Oregon as a kind of “planning paradise,” with smartly designed, compact cities; verdant fields and pastures; magnificent timber stands; and unparalleled vistas. It's also a legacy at middle age, one that has weathered the uncertainty of natural hazards—eroding slopes of litigation, economic fault-lines and ballot boxinstigated tremors, the tsunami of property rights proponents, the silent, toxifying radon of apathy. Forty years constitutes three generations of net migration spilling across Oregon's borders, of rural communities losing resource-based economies largely because of recession and federal forest policies, salmon runs declining. Old jobs disappeared in one place; new industries emerged in another. Demographics changed, and two million Oregonians are now nearly four million. complicated. 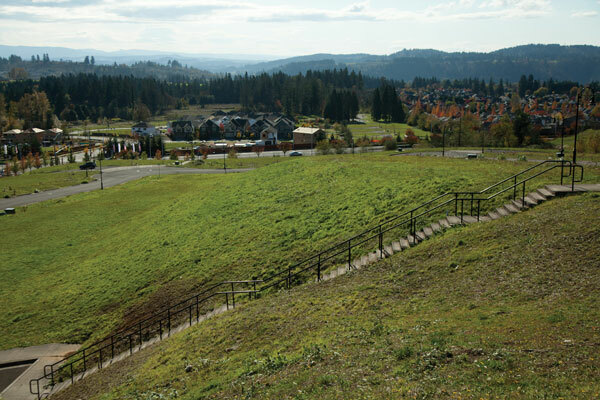 The 127-page manual “Putting the People in Planning: A Primer on Public Participation in Planning,” produced by Oregon's Citizen Involvement Advisory Committee, warns: “Today, the citizen who wants to participate in planning needs to understand basic land use procedures and rules. You might say the price of admission to the planning arena is information—and the price has gone up.” That “She flies with her own wings” spirit of SB 100 has devolved into a technocratic merry-go-round of estimates, guesstimates, amendments, remands, litigation, appeals, acknowledgments, expansions, and reserves. Jeffrey Condit, a partner at the law firm of Miller Nash, has spent three decades working on various aspects of land use and represents both municipal and private interests. He sees a growing futility in trying to parse increasingly complex land-use regulations. Yet, he concedes, “It's achieved protection of valuable forest and farm resource lands, and it's done a pretty good job [of] encouraging compact urban development within urban growth boundaries.” But now what? For too many communities, Oregon's land-use system offers too few concrete answers to that question. Consider Coos Bay: The Coos Bay estuary is one of only three deep-draft estuaries in Oregon, meaning that it maintains a jetty and a main channel deeper than twenty-two feet. The recently reestablished Coos Bay Rail Link connects the port and nearby communities to rail hubs in Eugene. With no major highway access to this southwestern corner of the state, rail service and a port are critical for the region's agricultural and timber industries. But the best use for waterfront property may not always be as a launch site for logs headed overseas. The region is littered with closed mills and industrial sites that will require cleanup. This is the case throughout the South Coast region. In nearby Reedsport, American Bridge Manufacturing announced in October that it will lay off all fifty-one employees at its manufacturing facility. New economic development is critical to attracting new residents and retaining the more than fifteen thousand who call Coos Bay home. To take advantage of these potential development sites requires upfront investments that are challenging enough to acquire even before tackling the requirements of the state's coastal goals (Goals 1619). 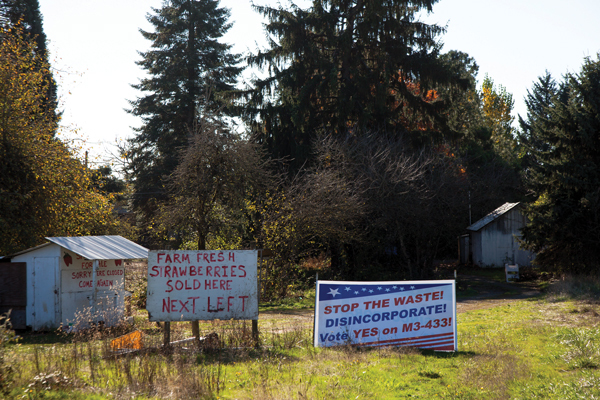 Oregon land-use rules preserve, but they don't make it easy to adapt to changing economies. The coastal rules add another layer of cost and complexity: What about landslides and floods and sensitive habitat areas? What about tsunamis? Show us the plan. “We're not just talking about changing land-use designation—we're talking about changing infrastructure,” says Coos Bay Mayor Crystal Shoji. She is currently optimistic about a modest mixed-use redevelopment in the Empire District in conjunction with the Confederated Tribes of Coos, Lower Umpqua, and Siuslaw Indians, as well as a potential seafood-products facility that was competing for the same land. “The world wants energy, and we're a shipping port,” says Shoji. “Our options point in the direction of our assets.” That's code for the phrase “liquefied natural gas terminal at Coos Bay”—a proposal for which is currently wending its way through regulatory approval, though a gauntlet of permits and environmentalists remains to be run. Community spirit manifests in other ways: organizing the annual Oregon Coast Music Festival, high school sports tournaments, and other efforts to draw visitors to town. Without a nearby urban area “that can use this as a playground,” says Shoji, Coos Bay and other South Coast communities have to work that much harder to fill motel rooms. “It's amazing what we pull off,” she says. Over in Central Oregon, the early 2000s were a good time to swing a framing hammer. From 1999 to 2009, the Bend metro area population exploded, with much of the growth happening inside the urban growth boundary established back in 1981, when the city's population was a mere 17,425 (compared to 80,000 within city limits today). The only thing growing faster was the number of new homes being built as Bend's real estate market shifted from a fevered pitch to fever dreams: new developments, golf courses, and even The Shire—a proposed subdivision inspired by the Lord of the Rings movies. To accommodate the site plans, in 2006 the project developer purchased a former mobile home park with eighty-two spaces and gave residents a year's notice to vacate. And then the bubble burst. Plans fell through. The Shire went into foreclosure, mostly unbuilt, and is now on the market as “Forest Creek.” One of its properties, Thatcher's Cottage on Ring Bearer Court, sold for $650,000 in 2007. It sold again in 2011 for the hobbit-size price of $227,000. The mobile homes remain in place for now. 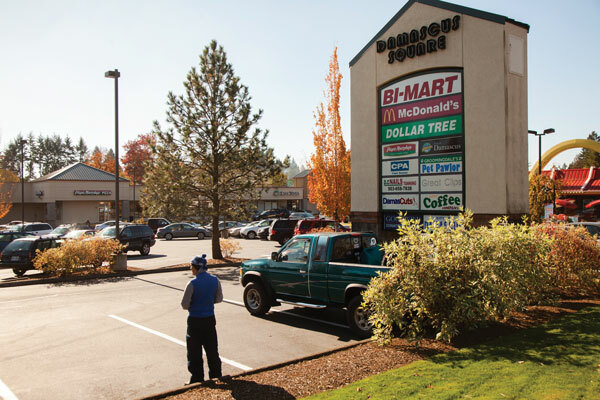 “When the real estate market was going gangbusters, there was economic and political pressure just to expand the boundary, versus doing redevelopment and infill,” says Damian Syrnyk, a senior planner with the city of Bend. But local pressure has not translated into success in navigating the complicated nuances of Oregon land-use planning. 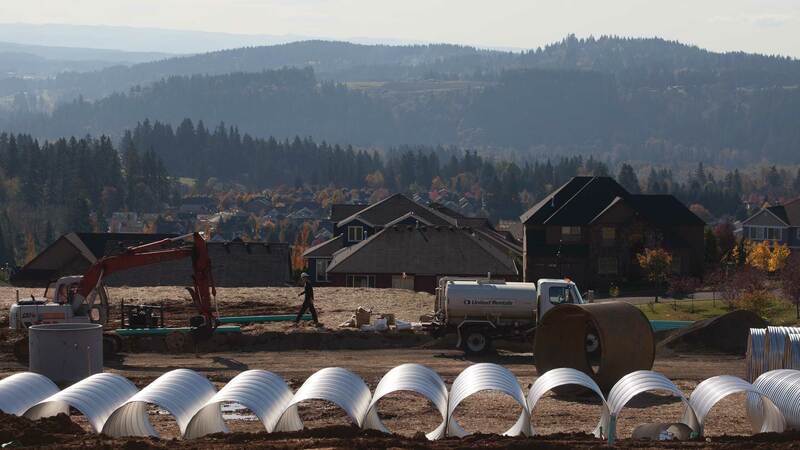 Bend's latest effort to amend its urban growth boundary revises portions of the plan first approved by the city in 2009 that called for an expansion of 8,500 acres. The state, in a 150-page response, rejected several pieces of the plan in 2011. With a committee at the state level rewriting some specifics of the planning rules, Syrnyk doesn't imagine having a new proposal in place before 2016. “We got more out of the boundary than we thought we would,” he says. Oregon's land-use system contained the Bend implosion's blast radius. “It could have been a lot worse,” says author and emeritus professor of urban studies and planning at Portland State University Carl Abbott, who has written extensively about land-use planning in Oregon. He sees successes in places like Bend, particularly when compared to other Western states, in preventing development such as that along Colorado's Front Range, which was made up of seemingly endless five- and ten-acre tracts that spread, Abbott says, “like smallpox.” In Oregon, Abbott says, we've curtailed that peripheral sprawl while keeping high-value farmland in production. More filberts and wine for us. The last go-round at boundary expansion drew mostly people such as developers and homebuilders, who had economic interests, and environmental groups opposing them. Now Syrnyk sees emerging interest from a more muted, moderate faction. The League of Women Voters held a forum in October where panelists reflecting a range of interests engaged one another and the audience in what Syrnyk described as “collegial dialogue” around the limits of Bend's urban growth boundary, population forecasting, water, climate change, and public involvement around planning. In 1982, months before succumbing to terminal cancer, Oregon's land-use champion Tom McCall stepped into the limelight to successfully stave off a ballot measure that would have repealed Senate Bill 100. Later, a series of measures in the 2000s sought to compensate landowners for value lost due to land-use regulations. Voters approved (even if the courts did not). Economic value trumped Oregon values. Individual rights would come before the collective good. Out of that decade emerged Oregon's most infamous planning exercise and what may become one of the state's shortest-lived cities: Damascus. A semi-rural community, Damascus sat at ground zero of an 18,867-acre urban growth boundary expansion in 2002 by Metro, the regional planning body that oversees a single boundary around much of Multnomah, Clackamas, and Washington Counties and the cities therein. The expansion was necessary to maintain the twenty-year supply of developable land for future housing and industry needs in the region, as mandated by Oregon land-use law. 12,500, or two-thirds, of those acres were around Damascus. Urban growth boundaries expand first to adjacent areas that are not designated as high-value farm- and forestlands. In 2002, much of unincorporated Washington County, west of Portland, was high-value agricultural area. Damascus, in unincorporated Clackamas County to the east, was not. Many of the ten thousand residents of the Damascus area worried that this expansion would change their bucolic exurban existences. The population of ten thousand would grow to thirty thousand in the coming decades. Life inside an urban growth boundary meant density, apartments, rules, and expenses—like the $3.5 billion needed to upgrade infrastructure to support a city of thirty thousand. In 2004, Damascus voted to incorporate as a city, the first community in Oregon to do so in twenty-two years. This, residents reasoned, would give them control over the growth being forced on the area, while generating funding for new infrastructure and a downtown. At the same time a steady undercurrent of anti-government, anti-growth, anti-consultant sentiment tugged at this optimism. Comprehensive planning efforts—required by state law—bogged down as conservative groups saw the new city as an opportunity of their own: local ballot measures passed in 2008 required a popular vote for any new taxes or fees and struck down the city's ability to claim eminent domain in condemning properties. 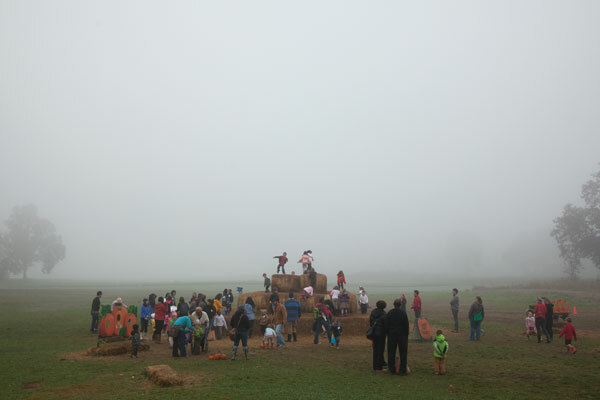 The reality was that few people stood to gain much from urbanization. The majority of properties were too small to subdivide and sell off as additional lots, and some that were large enough had instead been identified as greenway spaces, meaning they couldn't be developed at all despite now being in an “urban” area. Public meetings devolved into shouting matches and had to be policed by armed deputies. In the dysfunctional world of Damascus politics, “yes” votes outpaced “no” by a two-to-one margin. But for the disincorporation measure to pass, “yes” votes were required from at least half of all registered voters; with too few votes cast overall, the measure failed. The city lives on, for now. Anita Yap served as Damascus's community development director from 2007 until her resignation in 2011. For two of those years she engaged in what she describes as “intense community outreach” as the nascent city worked to establish its path forward. In that time she regularly encountered twenty-year residents living on five-acre tracts at the end of long driveways who did not even know their immediate neighbors. Politics became partisan and extreme, and, she says, “when things got a little dicey” (meaning, in this case, threats of violence and intimidation), the moderate middle of this emerging community disengaged from the planning discourse. Yap was threatened by consultants and stalked by a former elected official against whom she filed a restraining order. She's moved on, but she harbors hopes that the planning work done in Damascus will contribute to the successes of some future communities or comprehensive plans. One way to define a community is by the values its residents share. Hubs for these commonalities can be its schools, its business community, even its fire district. Damascus instead reflects the fractured social structures around which it incorporated: portions of five school districts, two separate fire districts, two different water districts. Its commercial sector is a collection of remote outposts of much larger entities—McDonald's, Safeway, Dollar Tree, Key Bank—with managers who often transfer out after a few years, taking with them whatever goodwill or civic sweat equity they had established. The ties that bind most tightly are those cinched against change. Our land-use system used to reflect what we loved about Oregon. Now what does it reflect? Have we changed? The 2013 Oregon Values & Beliefs Survey affirms that Oregonians still care deeply about those issues that inspired Senate Bill 100: the environment, protecting productive farm- and forestland from development, finding common ground and working together. But those tasked with protecting these values? We believe they (collectively known as “the government”) are wasteful and inefficient and can't be counted on to make good choices. Seven out of eight Oregonians agree that taxes are necessary to pay for the common good. But a majority also feels that our tax system is unfair and too complicated. Survey says. Maybe our values haven't changed so much as multiplied. We're Oregonians. We aren't afraid of the fast-moving current of conflict. We're well-intended. We get involved. But today's planning waters can seem too cold, too deep, too wide to cross. The moderate middle of our electorate—with our shared values and good intentions—wishes that Strategic Blue Ribbon Reset Analysis Commission well with its study and recommendations. Fix that system! We'll sign the petition. We'll come to the meeting. But follow-up meetings every third Tuesday evening for eighteen months? Good intentions don't get dinner made or kids to school or dogs walked or aging parents cared for or the clock punched on a first or second (or third) job. The solutions to these challenges seem perpetually out of reach: a lawsuit, a legislative committee, another day away. In Katy and the Big Snow, a blizzard shuts down the city. A house is on fire. A woman is in labor. A plane circles the airport, unable to land. The highway department's trucks are stuck. But Katy, the red crawler tractor with the big snow plow, comes to the rescue. “Follow me,” she says, and clears a path. Here in Oregon's Geoppolis some of us are digging out. Others are digging in. Katy's nowhere in sight. And the big snow, still falling, obscures our vision of the place we loved, this place planned for you and me. J. David Santen Jr. lives in Portland with his family and likes his neighbors, but wishes he had a small farm instead.